In my last post about my Intel 2 in 1, I talked about getting familiar with Windows 8 and the different feeling it has compared to other Windows versions. For this post, I decided I would show you what using my 2 in 1 like a laptop is like. I have a Dell Inspiron 11 3000 Series, which you can view here along with other Intel 2 in 1 laptop tablet options. As part of the Intel 2 in 1 Smart Squad, I’m testing out an Intel 2 in 1 Dell Inspiron 11 3000 Series tablet/computer. Full disclosure: I’ve never run a Windows 8 PC before and have no idea what I’m doing. It’s interesting and definitely has a very tablet home screen kind of feel to it as well. I actually expected my Intel 2 in 1 to be smaller. It’s a good size and a good balance between tablet and computer. Would I want to develop software on it for 10 hours/day? Probably not, but it’s the perfect size for travel. The Samsung Galaxy Camera is in a class of devices that you might call a smart camera. It’s Verizon Wireless 4G LTE enabled, which means you can snap and share your photos immediately. The Instagram app is available, as well as Dropbox, Facebook, Google+, etc. It should come as no surprise that my favorite way to share photos is Instagram and I loved having a huge touchscreen to edit and select photos on. I also had some fun with the different shooting modes like Beauty, Silhouete and Party/Indoor. 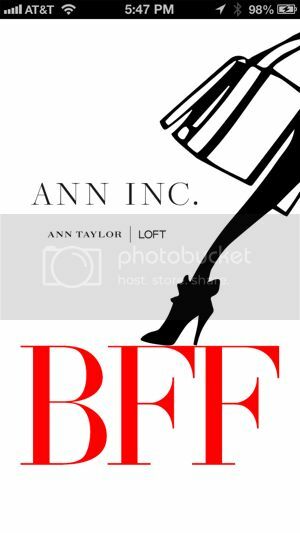 BFF (Best Foot Forward) is a new resource for women by ANN INC., creator of the Ann Taylor and LOFT brands. The app includes behind the scenes videos, inspirational quotes, interviews with ANN INC. employees and more. Filed Under: ad-free, tech Tagged With: ann inc. Right. So. I haven’t been posting much or reading much lately. Where’ve I been? I’m pretty much pants at design, so I’m attempting to learn Ruby. Serious programming. This is so not HTML. It’s a lot more fun than HTML, although the learning curve is much higher. Are you on Quora? Let’s connect! I’ve been on Quora for quite a while now, but I’ve only recently started truly being a part of the community. I’m following the Instagram and photography topics, of course, and even shared what I consider the best Instagram photo I’ve ever taken. There’s a lot of great content, including answers from Julie Fredrickson (formerly of social media at Ann Taylor), and a fantastically amusing post on time management that includes the words “Jedi time tricks”. But if you’d like to read something that will truly give you pause, try this answer to the question What are the top 10 things that we should be informed about in life?. You can find me on Quora under my real name — as you are supposed to be — and if you’re on Quora, too, let me know in the comments! I love love love phone charms. I started collecting them in college when I studied abroad in Japan, where most people have at least three, but having five or more isn’t uncommon. I have Hello Kitty charms, cake charms with bells attached, whale charms from the aquarium, traditional silk koi charms from historic areas, kitten charms with screen cleaner fabric on their stomachs, and many more.